Margaret White: [long bellowing cry from behind the door] Help me! Q: What is "Carrie" about? Q: Is "Carrie" based on a book? It is just a plain remake of the original movie with nothing of substance added. The main difference is it doesn't have that wonderful, creepy performance by Sissy Spaceck as Carrie, which is a big negative. 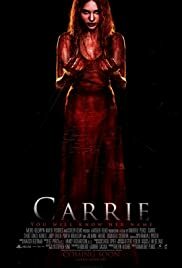 The only thing this movie adds is a little extra dimension to Carrie's mom - she seems to display signs of schizophrenia or borderline personality disorder rather than just being an evil bible basher, but that alone doesn't make this movie worth watching.